Emilio Aguinaldo y Famy QSC PLH (March 23, 1869 – February 6, 1964) was a Filipino revolutionary, politician,and a military leader who is officially recognized as the First President of the Philippines (1899–1901) and led Philippine forces first against Spain in the latter part of the Philippine Revolution (1896–1897), and then in the Spanish–American War (1898), and finally against the United States during the Philippine–American War (1899–1901). He was captured by American forces in 1901, which brought an end to his presidency. In 1935 Aguinaldo ran unsuccessfully for president of the Philippine Commonwealth against Manuel Quezon. After the Japanese invasion of the Philippines in 1941, he cooperated with the new rulers, even making a radio appeal for the surrender of the American and Filipino forces on Bataan. He was arrested as a collaborator after the Americans returned but was later freed in a general amnesty. 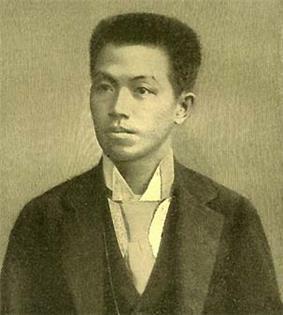 Emilio Aguinaldo was born on March 23, 1869 in Cavite el Viejo (present-day Kawit), in Cavite (province), to Carlos Aguinaldo y Jamir and Trinidad Famy, a Tagalog Chinese mestizo couple who had eight children, the seventh of whom was Emilio. The Aguinaldo family was quite well-to-do, as his father, Carlos Aguinaldo was the community's appointed gobernadorcillo (municipal governor) in the Spanish colonial administration. He studied at Colegio de San Juan de Letran but wasn't able to finish his studies due to outbreak of cholera. Emilio became the "Cabeza de Barangay" of Binakayan, a chief barrio of Cavite el Viejo, when he was only 17 years old to avoid conscription. In 1895 the "gobernadorcillo capitan municipal" (Municipal Governor-Captain) while on a business trip in Mindoro. On January 1, 1896, he married Hilaria del Rosario (1877–1921). They had five children: Carmen Aguinaldo Melencio, Emilio Aguinaldo, Jr, Maria Aguinaldo Poblete, Cristina Aguinaldo Suntay and Miguel Aguinaldo. Hilaria died of leprosy on March 6, 1921 at the age of 44. Nine years later, on July 14, 1930, Aguinaldo married Maria Agoncillo (February 15, 1879 – May 29, 1963) at Barasoain Church. She died on May 29, 1963 at the age of 82, a year before Aguinaldo himself. The flag of the Magdalo faction led by Baldomero Aguinaldo. In 1894, Aguinaldo joined the "Andrés Bonifacio, dedicated to the expulsion of the Spanish and independence of the Philippines through armed force. (p77) Aguinaldo used the nom de guerre Magdalo, in honor of Mary Magdalene. (p179) His local chapter of the Katipunan, headed by his cousin Baldomero Aguinaldo, was called Sanguniang Magdalo. "The Successful Revolution of 1896 was masonically inspired, masonically led, and masonically executed, and I venture to say that the first Philippine Republic of which I was its humble President, was an achievement we owe largely, to Masonry and the Masons." 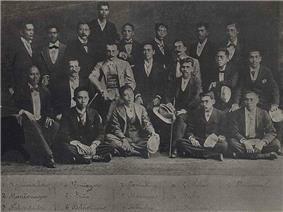 The Katipunan-led Philippine Revolution against the Spanish began in the last week of August 1896 in San Juan del Monte (now part of Metro Manila). (p176) However, Aguinaldo and other Cavite rebels initially refused to join in the offensive alleging lack of arms. Their absence contributed to the defeat of Katipunan leader Andres Bonifacio's there. While Bonifacio and other rebels were forced to resort to guerrilla warfare, Aguinaldo and the Cavite rebels won major victories in set-piece battles, temporarily driving the Spanish out of their area. On February 17, 1897 Aguinaldo and a group of katipuneros defeated Spanish forces led by General Camilo de Polavieja at the Battle of Zapote Bridge in Cavite. The province of Cavite gradually emerged as the Revolution's hotbed, and the Aguinaldo-led katipuneros had a string of victories there. 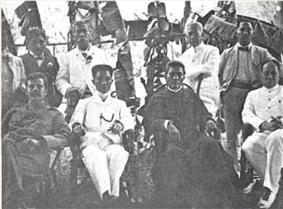 Emilio Aguinaldo with the exiled revolutionaries in Hong Kong. On May 24, 1898 in Cavite, Aguinaldo issued a proclamation in which he assumed command of all Philippine forces and established a dictatorial government with himself as dictator. The First Philippine Republic was formally established with the proclamation of the Malolos Constitution on January 21, 1899 in Malolos, Bulacan and endured until the capture of Emilio Aguinaldo by the American forces on March 23, 1901 in Palanan, Isabela, which effectively dissolved the First Republic. Aguinaldo appointed two Prime Ministers of the Philippines in his tenure, Apolinario Mabini and Pedro Paterno. He had two cabinets in the year 1899. Thereafter, the military situation resulted in his ruling by decree. On August 12, 1898, American forces captured Manila during the Battle of Manila and on August 14, 1898 established the United States Military Government of the Philippine Islands, with Major General Wesley Merritt as the first American Military Governor. 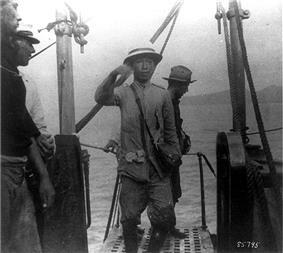 (pp110–112) On the night of February 4, 1899, a Filipino was shot by an American sentry. This incident was considered to be the beginning of the Philippine–American War, and culminated in the 1899 Battle of Manila between American and Filipino forces. Superior American technology drove Filipino troops away from the city, and Aguinaldo's government had to move from one place to another as the military situation escalated. 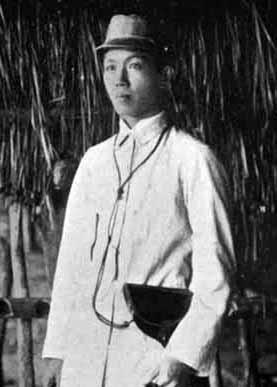 (pp268–270, 273–274) Aguinaldo led the resistance against the Americans but retreated to Northern Luzon. On March 23, 1901, Aguinaldo was captured in his headquarters in Palanan, Isabela. :507–509 One of these forces was led by Gen. Macario Sakay who established the Tagalog Republic. On April 19, 1901, Aguinaldo took an oath of allegiance to the United States, formally ending the First Republic and recognizing the sovereignty of the United States over the Philippines. (pp274–275) After the capture of Aguinaldo, some Filipino commanders continued the revolution. On July 30, 1901 General Miguel Malvar issued a manifesto saying, "Forward, without ever turning back... All wars of independence have been obliged to suffer terrible tests! "(p275) General Malvar surrendered to U.S forces in Lipa, Batangas on April 16, 1902. The war was formally ended by a unilateral proclamation of general amnesty by U.S. President Theodore Roosevelt on July 4, 1902. Aguinaldo and Quezon during Flag Day, 1935. During the American period, Aguinaldo supported groups that advocated for immediate independence and helped veterans of the struggle. He organized the Asociación de los Veteranos de la Revolución (Association of Veterans of the Revolution) to secure pensions for its members and made arrangements for them to buy land on installment from the government. Displaying the Philippine flag was declared illegal by the Sedition Act of 1907. However, the Act was amended on October 30, 1919. Following this, Aguinaldo transformed his home in Kawit into a monument to the flag, the revolution and the Declaration of Independence. As of 2015, his home still stands and is known as the Aguinaldo Shrine. Aguinaldo retired from public life for many years. In 1935, when the Commonwealth of the Philippines was established in preparation for Philippine independence, he ran for president in the Philippine presidential election, 1935, but lost by a landslide to Manuel L. Quezon. The two men formally reconciled in 1941, when President Quezon moved Flag Day to June 12, to commemorate the proclamation of Philippine independence. Aguinaldo was 77 when the United States Government recognized Philippine independence in the Treaty of Manila, in accordance with the Tydings–McDuffie Act of 1934. In 1950, President Elpidio Quirino appointed Aguinaldo as a member of the Philippine Council of State, where he served a full term. He returned to retirement soon after, dedicating his time and attention to veteran soldiers' "interests and welfare". He was made an honorary Doctor of Laws, Honoris Causa, by the University of the Philippines in 1953. On May 12, 1962, President Diosdado Macapagal changed the celebration of Independence Day from July 4 to June 12. There is no doubt that President Macapagal intended the proclamation to have that effect Although in poor health by this time, Aguinaldo attended that year's Independence Day observances. On August 4, 1964, Republic Act No. 4166 proclaimed the twelfth day of June as the Philippine Independence Day and renamed the Fourth of July holiday to "Philippine Republic Day". Tomb of Aguinaldo in Kawit. The Philippine 5 peso bill depicting Aguinaldo. Aguinaldo was rushed to Veterans Memorial Medical Center in Quezon City on October 5, 1962, under the care of Dra. Juana Blanco Fernandez, MD, where he stayed there for 469 days until he died of coronary thrombosis at age 94 on February 6, 1964. A year before his death, he donated his lot and mansion to the government. This property now serves as a shrine to "perpetuate the spirit of the Revolution of 1896". In 1964, his book was published entitled "Mga Gunita ng Himagsikan" Memoirs of the Revolution. A second publication was made in 1998 during the 100th year anniversary of Philippine Independence. In 1985, Bangko Sentral ng Pilipinas issued a new 5-peso bill depicting a portrait of Aguinaldo on the front. The back features the declaration of the Philippine independence on June 12, 1898. Printing was discontinued in 1995, when it was replaced with a ₱5.00 coin whose obverse features a portrait of Aguinaldo. Portrayed by Raymond Alsona in the 1992 film, Bayani. Portrayed by Joel Torre in the 1997 film, Tirad Pass: The Story of Gen. Gregorio del Pilar. Portrayed by Johnny Solomon in the 2008 film, Baler. Portrayed by Lance Raymundo in the 2010 film, Ang Paglilitis ni Andres Bonifacio. Portrayed by Jericho Ejercito and E.R. Ejercito in the 2012 film, El Presidente. Portrayed by Nico Antonio in the 2013 TV series, Katipunan. Portrayed by Jun Nayra in the 2014 film, Bonifacio: Ang Unang Pangulo. Portrayed by Mon Confiado in the 2015 film, Heneral Luna. ^ January 23, 1899 was the date of Aguinaldo's inauguration as President under the First Philippine Republic of the Malolos Constitution. Previously, he held positions as President of a Revolutionary Government from March 22, 1897 to November 1, 1897, President of the Biak-na-Bato Republic from November 2, 1897 to December 15, 1897, Head of a Dictatorial Government from May 24, 1898 to June 22, 1898, and President of another Revolutionary Government from June 23, 1898 to January 22, 1897. ^ April 1, 1901 was the date of Aguinaldo's capture by American forces. ^ a b Most sources, including the National Historical Commission of the Philippines, support a March 23 birthdate. (p)(p) Some sources give other dates. ^ a b The year of birth on his death certificate was incorrectly typed as 1809. "Philippines, Civil Registration (Local), 1888-1983," index and images, FamilySearch (https://familysearch.org/pal:/MM9.3.1/TH-1971-27184-32236-46?cc=1410394&wc=9Z7H-JWG:25272501,114827101,25271303,25290201 : accessed May 2, 2014), Metropolitan Manila > Quezon City > Death certificates > 1964; citing National Census and Statistics Office, Manila. CAUTUSAN: Gobierno Revolucionario nang Filipinas at the Wayback Machine (archived December 11, 2007) [in Tagalog] A decree dated January 2, 1899 signed by Emilio Aguinaldo establishing a council of government. Aguinaldo: A Narrative of Filipino Ambitions at the Wayback Machine (archived February 13, 2008) Book written by American Consul Wildman of Hong Kong regarding Emilio Aguinaldo and the Filipino–American War during the early 1900s.